Your hardwood floors are not only beautiful; they are a great investment and deserve proper care. Some traditional cleaning methods can be damaging to wood. By using a plain mop and bucket, you can saturate floors with excess water, which can cause the wood to swell or buckle. Additionally, inappropriate cleaners may leave a dull residue. So how do you care for your floors? That�s where Orange Glo comes in. We are committed to helping you keep your hardwood floors beautiful and protected. 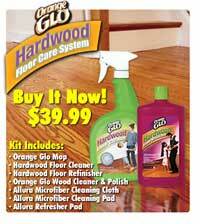 The Orange Glo Hardwood Floor Care System is an easy-to-use maintenance program for all wood floors. That hardwood luster you love can last for years with the help of Orange Glo! Unlike standard bristle brooms that have been around for hundreds of years, the OneSweep has been scientifically engineered to be the most advanced broom ever created. The OneSweep is constructed of indestructible space-age polymers with strategically placed bristle design. 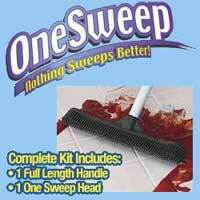 The OneSweep sweeps better than anything you�ve ever used before. 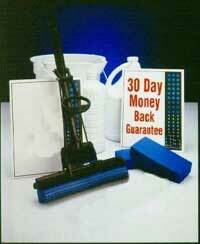 Works on Wood, Glass, Tile, Concrete, and even cleans pet hair out of carpet. Does your floor need a good scrubbing? Don�t get down on your hands and knees! 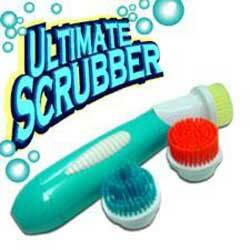 With a little soap and water, OneSweep is the best scrub brush you�ve ever used. With the 56� handle, you can now stand while you scrub. 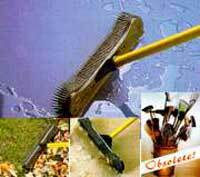 There�s even a built-in squeegee to dry surfaces off. Window cleaning has never been easier.. 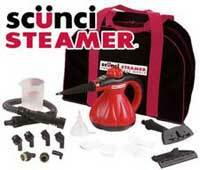 The Scunci Steamer Hand Held cleans, sanitizes, and deodorizes with 1000 watts of power. Scunci steams away mildew, mold, grease, and grime without harsh chemicals. 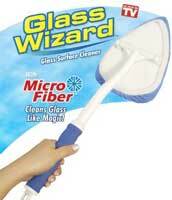 Ideal for cleaning bathrooms, kitchens, appliances, counter tops, ovens, tile, windows, and mirrors. Restore 4 breathes new life into fiberglass, porcelain, terrazzo, ceramic tile and grout. 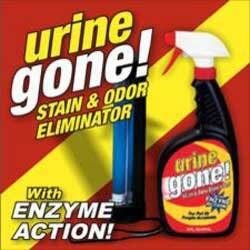 Will effectively penetrate and dissolve hard water stains, rust, calcium buildup, limescale, soap film and dirt. Great for kitchen tile floors and counters, entryways, tile walls, and floors, fiberglass tubs and shower pans as well as porcelain sinks, toilets, and tubs! ALSO INCLUDED are the Restore 4 Wood Restorer, Grout Sealer, and Restore 4+ for Formica, Linoleum, Corian, Vinyl, Marble, and Granite! The revolutionary new rolling cleaner that attracts dirt like a magnet! Stick-It instantly picks up lint, dust, pet hair, dirt, sand and much more. For All Surfaces, Indoors & Out! CLEANS EVERYWHERE - WET OR DRY! 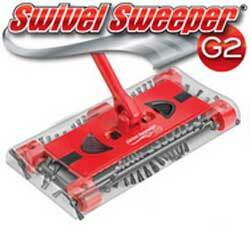 It sweeps, scrubs, squeegees, washes out and holds it's shape like no other broom in the world. Unique suction device fits any handle, does not scruff furniture, soft bristles reach those difficult to access areas such as joints and crevices. 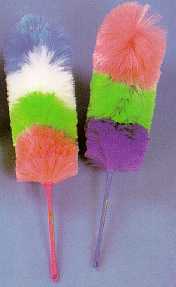 The Original Miracle Mop Wrings Out With a Simple Twist of the Handle. Plumper mop head is highly absorbent and won't scratch any hard surfaces. Soft Cotton mop head, has approximately a 300 foot continuous loop. Machine Washable and Bleachable, plus the mop head is replaceable. 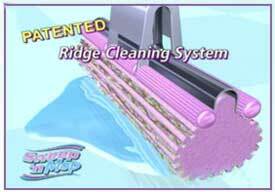 Specially designed for cleaning those hard to reach places, including corners. Also works great as a dust mop. E-Z grip locking handle is made of a lightweight, durable plastic.